Pet meds and pet supplies at Guaranteed Low Prices. You'll save on Frontline, Advantage, Heartgard, K9 Advantix, Rimadyl, Deramaxx, Sentinel , Metacam and more! Browse our site and find the pet medications your pet needs. 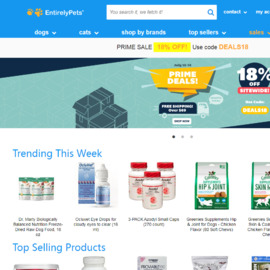 At EntirelyPets.com, you'll save money on pet meds. Fast and free shipping on orders over $100. *No cashback on some items. Click a Coupon or click Start Shopping to earn Up to 4% Cash Back at EntirelyPets.